The Whitehorse Waterfront Trolley is up and running again this summer after being closed for maintenance last year. Douglas Trim has been living and working in Whitehorse for 42 years. 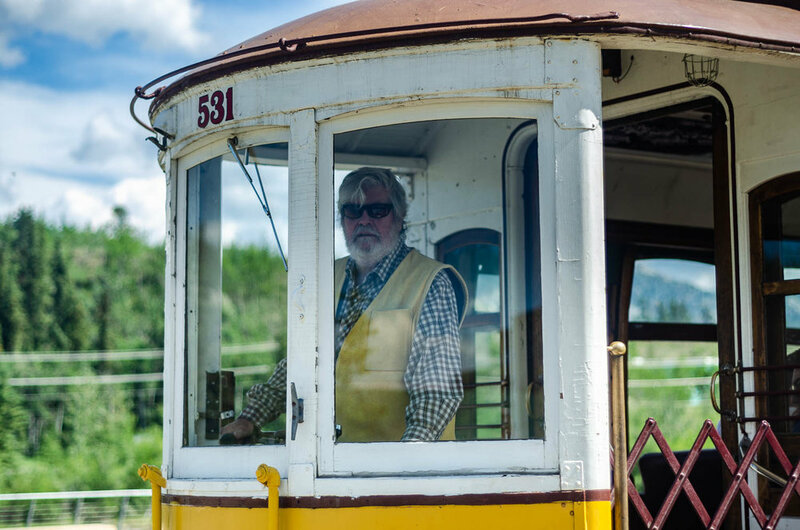 These days he’s the trolley conductor for the popular tourist attraction that runs alongside the multi-use path on the Yukon River in downtown Whitehorse. Trim is joined on the trolley by Nylan Zalitis, an 18-year-old from Whitehorse who works as an interpreter for the MacBride Museum, which owns the waterfront trolley. While Trim operates the trolley, Zalitis welcomes riders and accepts their $1 fares. The waterfront trolley runs along the historic route of the White Pass and Yukon Route, a rail line that connected Skagway, Alaska, with Whitehorse for over 80 years before it closed in 1982. However, the trolley used on the route today was never used in Whitehorse, nor was it even built in Canada. Instead, Zalitis says the trolley was built in Portugal in 1925, and shipped over to North America in the ‘80s. There are small reminders of the trolley’s Portuguese past throughout the trolley, such as a sign that says “24 lugares,” which means “24 seats” in Portuguese. When the White Pass and Yukon Route was finished in 1900, it became the easiest way to get from Skagway to Whitehorse, says Zalitis. “Previously you had to climb over the Chilkoot or White Pass — that’s where you see all those gold rush pictures,” he says. Once the train arrived in Whitehorse, sternwheelers would bring up goods and people to Dawson. After the gold rush, Zalitis says the rail line was also used extensively during the construction of the Alaska Highway. “The U.S. Army leased the railroad, and they basically brought in 25 trains a day. Previously Whitehorse had only one train per weekend,” he remarks. The White Pass and Yukon Route would go on to keep bringing supplies to Whitehorse until the mine in Faro closed in 1982, Zalitis says. David Pankhurst rode the waterfront trolley during his month-long trip to the Yukon and Alaska. He came all the way from a town on the southern tip of New Zealand to visit Canada’s north. Pankhurst is just one of the hundreds of visitors to Whitehorse that take in the trolley experience. Although they don’t have official statistics, Zalitis says on July 3, 2018, about 120 passengers rode the trolley. On Canada Day, he says, there was standing room only. 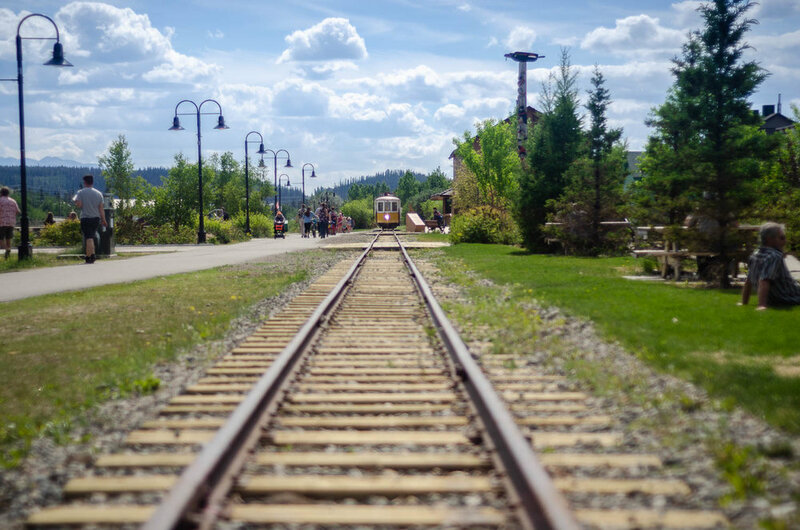 This summer the Whitehorse Waterfront Trolley runs from Rotary Park to the Trolley Roundhouse at Front and Wood streets, with stops at the Visitor Information Centre and the old White Pass Station. Next year, Zalitis says MacBride Museum hopes to open up the full trolley line from the Trolley Roundhouse to Spook Creek Station.